Is it possible to temporarily skip media restore in WhatsApp? I use WhatsApp on an iPhone X. I have chat history and media backed up on my iCloud. The total size of the backup is around 6 GB. I had to send in the iPhone X for repair, and I’m using a temporarily loaned iPhone 6. I restored the WhatsApp chat history from iCloud, but the iPhone 6 is a 16 GB variant. I’m unable to restore the media onto this phone since “system files” are around 11 GB. If I turn off iCloud Drive, it goes down to 7 GB but with that turned off, I can’t backup/restore WhatsApp. The only thing enabled in iCloud Drive is WhatsApp so I don’t know why it’s consuming 4GB on the phone when I haven’t restored media. If I skip the media restore, and continue backing up the chat history, will I be able to restore the entire chat history and media on my iPhone X when I get it back? Will the media part of the backup be erased from iCloud if I skip media restore and do a chat history backup on the temporary phone? The important thing is that you restore the backup on the iPhone 6. Once restored, it disables the backup of that iPhone 6 so that it does not replace the original copy of the iPhone X. Then when you have your iPhone X again, you will be able to restore the copy original. On the other hand I recommend that you make a backup in iCloud of all the content and a backup in iTunes. Not the answer you're looking for? Browse other questions tagged iphone icloud backup restore whatsapp.app . Possible to transfer WhatsApp history from Android to iOS? How to export all elements in a iPhone WhatsApp chat? 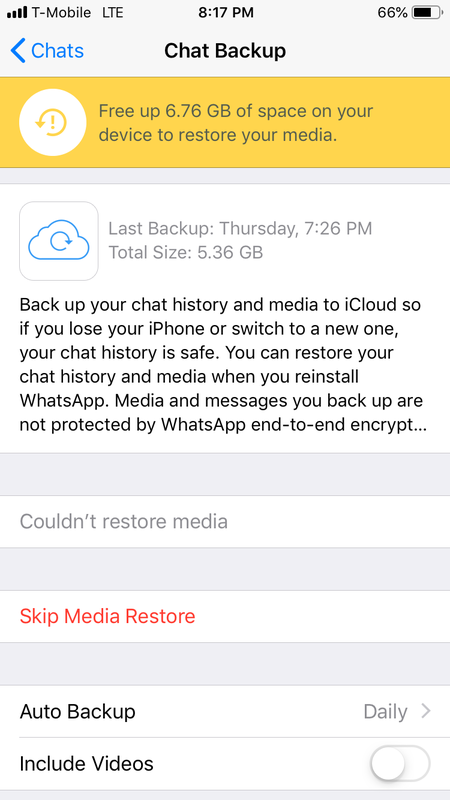 Why does WhatsApp require so much space for iCloud backup?